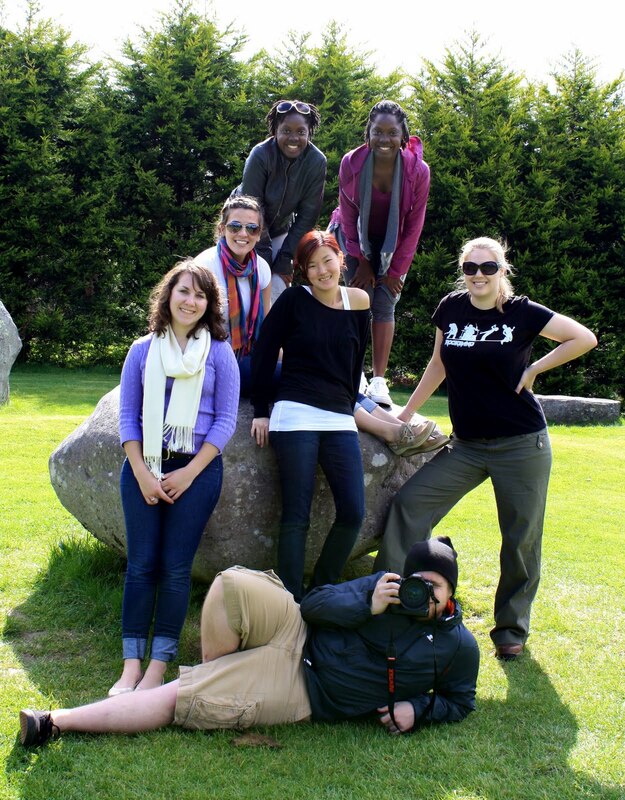 From May 9-23, Andrea Frantz, Ph.D., associate professor and head of RMU’s Department of Communication, and Christine E. Holtz, RMU professor of Media Arts, accompanied 19 journalism and photography students to Sneem, Ireland, a village of 400 in the Ring of Kerry in the Southwest part of the country. While there, the journalism students focused on learning the stories of the community by interviewing villagers and photographing, writing, and blogging about them. The photo students were challenged to develop themes for their photography and shoot with the goal of creating photo books. The students also sought to learn about the culture of rural, southwest Ireland by listening to and practicing traditional Irish storytelling and performing music. The group’s guide, Mr. Batt Burns, offered several workshops in storytelling as well as a great deal of historical insight into the area. Frantz, Holtz, and their students traveled to the Cliffs of Moher, Galway, Killarney, and the Blasket Islands. Students also took part in hiking, biking, kayaking, and golf. One evening the group even enjoyed a traditional pub night in which the students shared their own talents in music, dancing, and storytelling, alongside the locals. By challenging students to practice community journalism in a small village in which they were forced to quickly learn its people, geography, history, and customs in order to locate and re-tell its stories, they were pushed out of their comfort zones. Following a particularly challenging interview with a local farmer, who possessed an extraordinarily thick Irish brogue and was very reticent to talk about himself, senior Heather Lowery told Frantz, “This is the hardest thing I have ever had to do in my four years as a journalism student.”Later on, however, when her story was complete, Lowery’s tune had changed. “I have never been more proud of any story I’ve written,” she said. Right on the tails of the journalism class came another RMU group led by Jim Vincent, associate professor of English studies, along with Heather Pinson, Ph.D., assistant professor of communications, and Alisa Krieger, student leader. Arriving on May 25, the group, which was made up of 25 students from Vincent’s Irish mythology and literature course, began its Ireland adventure in the town of Mullaghbane in County Armagh. There they stayed in the cultural center of Ti Chulainn, an agricultural, isolated, mountainous region, famous for being a stronghold of the home hunting grounds of the Red Branch Knights of ancient Ireland, and their leader Cuchulainn. Students also climbed the mountain of Slieve Gullion and visited Navan Fort and Giant’s Causeway. They even toured Newgrange, which is 600 years older than the pyramids of Egypt and contains passage tombs of Irish settlers from well before the Celtic Age. During the second part of their trip, on the way to Sligo, they stopped at the Ulster American Folk Park in Omagh, County Tyron, which is a large park full of re-enactors who depict both Ulster and American life in the late 18th century. While at the park they had a night of music with local musicians as well as RMU singers Dawn Savage ‘11, Shaun Sweeney, and Melissa Curiale. The visit to the park was coordinated by former Rooney Scholar Marie Martin and her husband Joe. The group also enjoyed a lunch hosted by Southwest College in the town Omagh. At Sligo (name means shallow or shelly), students concentrated on the life and poetry of Ireland’s most famous poet William Butler Yeats. Sligo was Yeats’ summer home; his poems “The Stolen Child” and “The Lake Isle of Inisfree” have their sources in this region. Here they explored by bus and by boat, and climbed Knocknarea, on top of which is the legendary burial site of Queen Medb. During their stay at The Yeats Village, since there wasn’t any cafeteria, the students got the chance to cook for themselves. “We found out who could cook and who couldn’t,” said Vincent. To wrap up their journey, the group spent a day and a half in Dublin, where some students visited St. Patrick’s Cathedral, others the Guinness Brewery, and some took pictures of Ireland’s scenic capital city. For more on RMU’s trips to Ireland, find them on Facebook (search “RMU Claddagh Club”) or on Flickr. From May 26-31, a group of Robert Morris University staff members, students, alumni, and friends embarked on a group bike ride from Pittsburgh to Washington, D.C., with stops in Ohio Pyle (Pa.), Cumberland (Md. ), Hancock (Md. ), and Harpers Ferry (W. Va.). 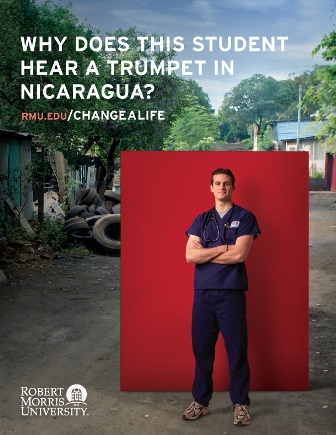 Over the next five days, RMU Senior Writer Valentine J. Brkich will be sharing his first-hand account of the journey. SPOILER ALERT: Val survived. Barely. Ride my bike to D.C. It sounded doable. Sure, I may just be your average desk jockey, but I try to keep in shape, going for the occasional jog and walking instead of driving to the bank or the grocery store when I can. I even stand up at my desk while working. Surely I was fit enough to ride 60 miles a day at a leisurely pace over a span of five-days. During the first two days of the trip, the 22 of us would be riding along the Great Allegheny Passage (G.A.P. ), an old rail bed covered with a layer of packed, crushed limestone, which snakes its way through southwestern Pennsylvania down to Cumberland, Md. The average grade is only 1% until you reach the Eastern Continental Divide. After that, I was told, it would be “all downhill” as we continued on the Chesapeake & Ohio (C&O) Canal Towpath to D.C.
Heck, this was going to be more like a vacation than anything. We hit the trail at 9:20 a.m. on May 26 in Boston, Pa. It was the perfect morning. Partly sunny. Temperature in the mid-60s. We were abuzz with anticipation as we mounted our pedal-powered steeds and shoved off for our nation’s capital, a mere 300 or so miles down the trail. If you’ve never ridden along an old rail trail, it triggers an awakening of the senses. A spring trickles down the rock face to your right. A butterfly flutters through the air to your left. The perfume of spring flowers. The crackle of rubber tire on crushed stone. It’s peaceful and exhilarating, and you feel as if you could ride forever. Then you hit the 5-mile mark. Five miles! Is that all the farther we’ve ridden? How many more do we have? FIFTY-FIVE?!?! I just need to get warmed up, I told myself, as fatigue began to set in. Then my allergies kicked in, and soon my eyes felt like they were filled with sand (Photo: My feeling-like-they’re-filled-with-sand eyes). Then my left knee began to throb. My upper back ached. My lower back began to spasm. Maybe I should have trained for this. This first day of our adventure saw a series of bad omens. At Boston, before he had even put foot to pedal, Todd Hamer, the ride’s organizer and RMU’s strength and conditioning coach, got a flat tire and immediately fell behind the pack. Bill Joyce, RMU’s director of planning and design, busted the crank on his bike and had to backtrack for a lost bolt. Further down the trail, Ethan, a sophomore finance major, clipped a wooden post and tore a gash in his right arm. Later on, his father, Mark, collided with an oncoming rider, flipped over his handlebars, and bent his front fork. Jamie, a sophomore psychology major, had a bad spill and suffered a painful cut on her left arm and a bruise on her hip. All along the trail there were landslides and signs of recently downed trees, giving you the eerie feeling that, at any moment, you could be pedaling your little heart out to avoid being crushed by a falling sycamore or an avalanche of mud and rock. And did I mention the unforgiving headwind? So much for a leisurely ride along the trail. We persevered, however, and continued on down the dusty trail, past the Old Dravo Cemetery (est. 1824); past secluded hamlets like Buena Vista, Van Meter, and Whitsett; and past the ghosts of former industry, like old trestles and the site of the once bustling Banning No. 1 Coal Mine. Somewhere along the trail I caught up with Jamie, who was struggling mightily under the mid-day sun. Luckily Mark J. Eschenfelder, Ph.D., associate professor of economics at RMU, his brother Michael, and their friend Jonathan were already there helping. After a brief stop to rest and rehydrate, we decided to walk a ways down the trail before hopping back on our bikes. Jamie recovered and was soon chugging along again. After a brief stop in Connellsville for lunch at the local Sheetz (Gatorade and a pre-wrapped mystery-meat sandwich), we continued on down the trail. By this time I had learned to hate milepost markers. You try to ignore them, so as not to see what little distance you’ve covered, but it’s impossible. They stick out from the foliage along the side of the trail like signposts of your physical inadequacy, mocking you as you huff and puff your way along the path. Finally in mid-afternoon we began to trickle into our day-one destination: Ohiopyle. Around 3:50 p.m. I slowly rolled across the town’s familiar arched bridge, which spans the white waters of the Youghiogheny River. Ethan and Mark were already there, so I had them pose for a photo with RoMo, who I’d brought along for the ride (Photo: Ethan and Mark with RoMo). Famished and fatigued, I stumbled passed Armand Buzzelli, RMU’s director of campus recreation, and Mike Yuhas, RMU event manager, sitting at the local ice cream shop enjoying milkshakes and looking way too composed. I hope I can stand up long enough to take a shower. An hour later, just as we were about to head off to dinner at Falls City Pub, a freak squall blew through, knocking out all power in town. Clearly the gods were against us. Fortunately there was enough cold beer to hold us off while Seth, an online MBA student, ordered pizzas from the next town over. When the pies finally arrived nearly an hour later, we tore into them like ravenous piranha. I managed to grab just two pieces in the frenzy, as the pub’s menu of mouthwatering specials stood nearby, reminding us of what we could have been eating (Photo: What we could have been eating). And so, still hungry and getting stiffer by the minute, I staggered back to my room to hit the sack early (8:30 p.m.) and prepare for the next day—the mostly uphill, 72-mile jaunt to Cumberland. Harper’s Ferry (W. Va.) to Washington, D.C.
We did it! We actually made it to Washington, D.C., five days and 300+ miles after hitting the Montour Trail in Boston, Pa. I have to admit, at times I thought the trail would never end. But it did, and boy, are my legs happy. One last thing…I’d like to personally thank RMU’s Wellness Committee for funding our bus ride back to Pittsburgh. Otherwise it would have been a looooong ride home (342.08 miles, to be exact). In the meantime, if anyone needs me, I’ll be sitting on a bag of frozen peas. Today my fellow RMU colleagues and I pedaled our way to Cumberland, Md., along the former towpath of the Chesapeake and Ohio Canal, which had its western terminus here. The city itself was built on the site of Fort Cumberland, which served as the starting point for British General Edward Braddock’s ill-fated attack on Fort Duquesne (present-day Pittsburgh) during the French and Indian War. The Battle of Folck’s Mill, also known as the Battle of Cumberland, was a small cavalry battle fought August 1, 1864, as part of the Valley Campaigns of 1864 during the Civil War. After burning Chambersburg, Pa., on July 30, Confederate Gens. Bradley T. Johnson and John McCausland led their cavalry brigades towards Cumberland to disrupt the B&O Railroad. On August 1, Union Brig. Gen. Benjamin Kelly, leading a small force of soldiers and citizens, ambushed the Rebel cavalrymen near Folck’s Mill, just outside of town. After several hours of fighting, the Confederates were forced to withdraw. In the end, Kelley’s stand saved the town of Cumberland and prevented further damage to the all-important railroads. Today is the first day of our five-day biking adventure to Washington, D.C. Our first stop along the way is Ohio Pyle—a quaint little town on a bend in the Youghiogheny River. In recent times Ohio Pyle has become known as a “trail town,” thanks to its location along the Great Allegheny Passage. It’s also a hot spot for whitewater rafting enthusiasts. And, like many small towns across Pennsylvania, Ohio Pyle was not left untouched by the Civil War. Take Ohio Pyle resident James Rowan (1810-1880), for example, who served in the war along with and four of his sons. James, husband of Catherine (Harbaugh) (1808-1893), enlisted in the 85th Pa. Volunteer Infantry, along with his son Leonard. Three other sons—David, Josiah and Jonas—all followed suit in various regiments. Jonas (1833-1872) and his brother David (1845-1876) enlisted with Company F of the 14th Pennsylvania Cavalry. Jonas was captured by the Confederates on Oct. 19, 1864, at Cedar Creek, Va. After the war he was sent to Fort Leavenworth, Kan., where he was discharged on Aug. 24, 1865. In the winter of 1872, he contracted typhoid pneumonia and never recovered. David survived the fighting but was killed in a railroad accident in Fayette County in 1876, some 11 years after the war’s end. Josiah (1833-1865) served in the 5th Pennsylvania Infantry, Company D, and died “on his way home from the war.” Nothing else is known of his service. Leonard Rowan (1838-1862) enlisted with the 85th Pennsylvania Infantry and saw heavy action in the battle of Fair Oaks/Seven Pines, Va., on May 30-31, 1862. He also took part in the Seven Days’ Battle. On Aug. 18, 1862, while on a march from Harrison’s Landing, Va., he became ill and was transferred some 60 miles southeast to Hygeia General Hospital near Hampton, Va. He passed away shortly thereafter. James, the father, died of heart disease on June 12, 1880, and is buried at the Indian Creek Baptist Church Cemetery in Mill Run (Fayette Co.) Pa., along with David, Josiah, and Jonas. As I ride through this sleepy little town, people all around me biking and hiking and braving the rapids of the Yough, I think about the sacrifices made by the Rowan/Harbaugh family almost 150 years ago, and it makes me appreciate how truly lucky I am today. So to them I say thank you. 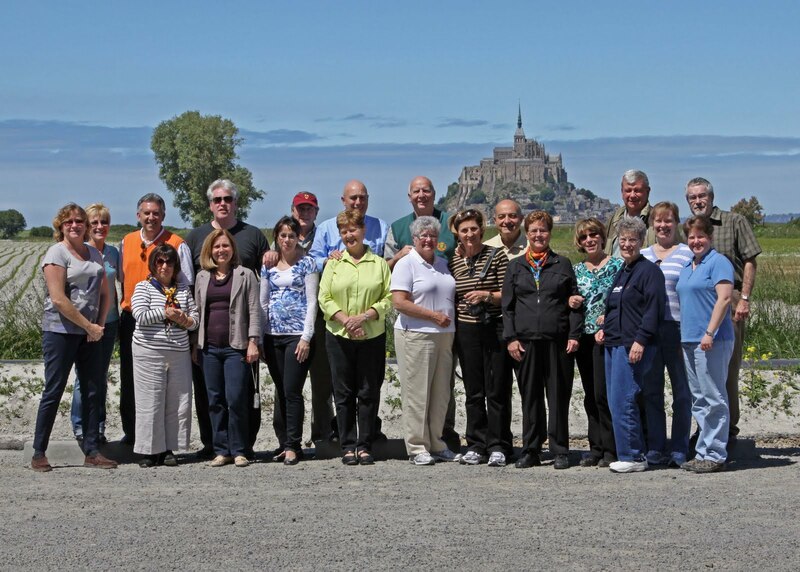 This past Sunday a group of Robert Morris University alumni and friends, along with President Greg Dell’Omo and his wife, Polly, embarked on a week-long, guided tour of France. After touching down at Charles de Gaulle airport, the group headed for Lion d’Or, their hotel in the old quarter of medieval Bayeux. Then, on Monday, they boarded a private coach north to Normandy, with its soaring seaside cliffs, rolling pastures, and medieval cities. After stopping for lunch and a stroll at Rouen, the historic port on the Seine, they made for Ville aux Cent Clochers (City of 100 Belfries) where they got a chance to discover architectural treasures like Notre Dame Cathedral, St. Ouen Abbey, Palais de Justice, and the Bourgtheroulde mansion. On Tuesday, the group toured Omaha Beach, where on June 6, 1944, the largest invading armada in history broke through the German defenses as they began their push to Berlin. The group also toured battlefields and visited Normandy American Cemetery and Memorial, where the remains of 9,386 U.S. soldiers now rest in peace beneath lines of marble crosses and Stars of David. Today the group is heading to the rocky citadel of Mont-Saint-Michel, historic symbol of France. There they will climb the steep Grande Rue to the 13th century abbey that crowns the island. Tomorrow the group will be Paris, stopping first to see the iconic water lilies at Giverny, which was once the home of the renowned Impressionist, Claude Monet. On Friday the group will enjoy a panoramic coach tour of the City of Lights, viewing one legendary attraction after another—The Louvre, the Arc de Triomphe, the Place de la Concorde. Saturday, they will take a walking tour of the Latin Quarter, for centuries the heart of Parisian intellectual life and the traditional haunt of artists, poets, and philosophers. Here they will view the baroque Cathedral of Saint-Sulpice, most recently made famous in Dan Brown’s The Da Vinci Code. On Sunday, the group will visit the astonishing Palace of Versailles, Louis XIV’s unequalled architectural extravagance. RMU’s 2011 Alumni Tour will conclude on Monday, May 23, as the group bids adieu to France and travels back across The Pond to Pittsburgh, which Post-Gazette writer Brian O’Neill refers to, appropriately, as The Paris of Appalachia. For more photos of RMU’s tour de France, click HERE.